Stomps around… Shoots big lasers… Eats AT-ATs… Must be a Tyrannomech! When making a series of Neoclassic Space mechs modelled on dinosaurs, your Tyrannosaur derivative had better be impressive. I hope I’ve achieved that goal. I always intended the Tyrannomech to be the biggest and baddest of my dinomechs. I was originally thinking it would have a crew of two, one or at most two big guns and a selection of smaller ones. A detachable head spaceship would be an added bonus. Then I actually started building. Working from the feet up (yeah, possibly a strange place to start, but I grew up in the era before SNOT became the expected norm, and I wasn’t quite sure how to do some of the techniques involving plates used as angled walls) it quickly became clear that this was going to be a considerably larger dinomech than I had originally envisioned. 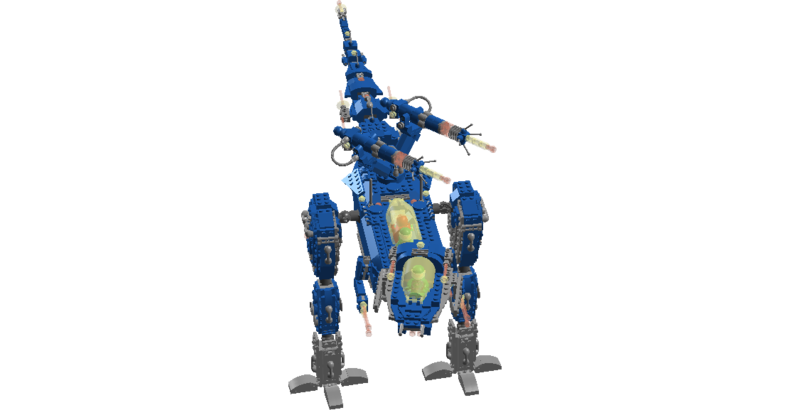 The Tyrannomech, sometimes called the T-mech for short, is the largest dinomech produced by the VLC Corporation and one of the most combat-capable mechs in use anywhere in the Galactic Federation. 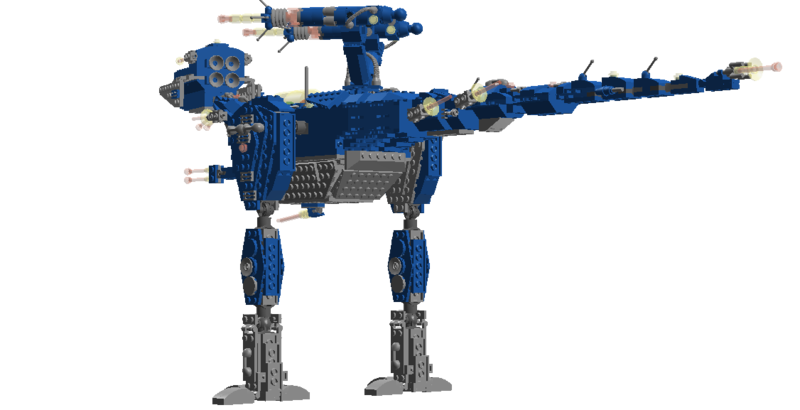 A large bipedal walker featuring a detachable reconnaissance spacecraft as the “head” and an elongated balancing tail, the Tyrannomech combines the heavy armament of many quadrupedal walkers with the better speed characteristics of bipeds. Gyroscopically stabilised and with the tail to aid in balancing, the stability problems sometimes associated with large biped walkers have been effectively overcome by Federation engineers. 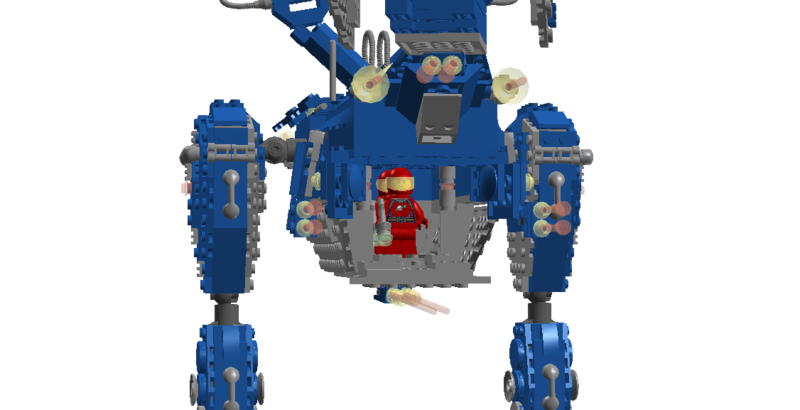 The T-mech has a crew of three and an internal transport bay able to hold up to four troops. It may be controlled solely from either of the dorsal cockpit control stations, or from the head via a specially-designed interface bracket, or functions may be shared between all three stations. The main armament is a pair of heavy antimatter lasers mounted on a dorsal turret featuring a unique double boom arrangement. Numerous other lasers and antimatter lasers act as secondary armament: two each on the small “arms”, four on the head mount, two more in a small ventral turret and five on the tail, making the prospect of attacking a T-mech from any angle a dangerous one. The reconnaissance spacecraft, known as the R3X fighter, features variable-angle wings and a pair of antimatter lasers as armament. 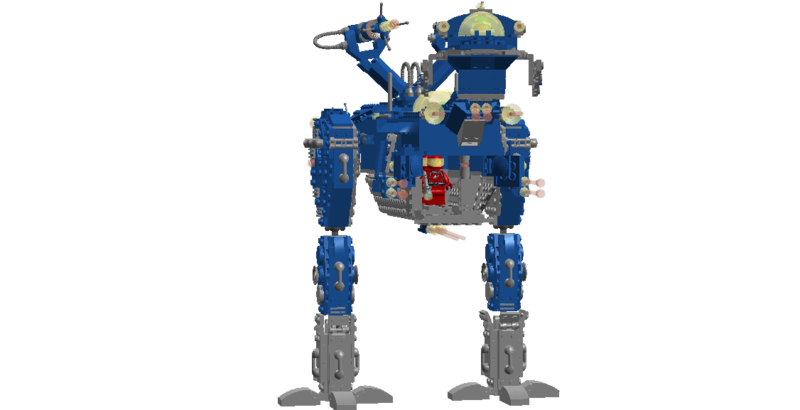 Its primary purpose is to give the T-mech an integral long-range reconnaissance ability. The Tyrannomech is not widely used outside of the Saurian Sector. In most of the Federation its design as a dedicated combat mech makes it less attractive to more peaceful Sector Commands requiring a more versatile design. In the dangerous Saurian Sector, however, it provides a much-needed heavy defensive capability. 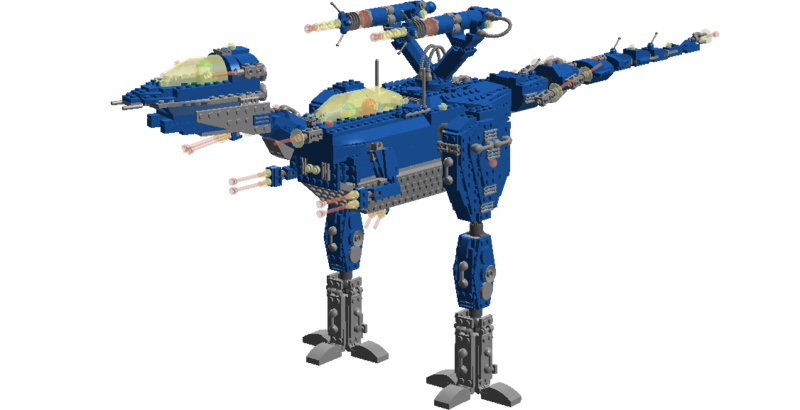 This entry was posted in Lego Classic Space, Mechs, Prehistoric beasts, Saurian Sector and tagged digital Lego, Dinomech, Galactic Federation, Lego, Lego Classic Space, Lego dinosaurs, Mech, Tyrannosaurus on March 31, 2015 by geoffhorswood. With the drastically upgunned nature of my dinosaur-inspired parallels of Classic Space hardware, it was obvious that I needed an adversary. I’ve always admired cephalopods, and there are some rather famous Mesozoic ones in the shape of the Ammonites, Belemnites and Orthocones. The Cephalon Dominion is a powerful and aggressive interstellar empire outside the borders of the Galactic Federation. Expanding into the Saurian Sector at the same time as the Federation, the Cephalon Dominion’s AstroNavy is one of the main adversaries of Space Fleet Command in the region. The Cephalon species is green-skinned, short, somewhat squidlike, and hostile to humanity. Due to the presence of extensive Sector-wide deposits of the rare energy crystal Mesozorium, tensions between the Dominion and the Federation are high, and conflicts are actually fairly common. Their bulbous spaceships and surface hardware in green, black and red colour scheme are easily recogniseable and quite deadly. A Cephalon planetary surface warrior. 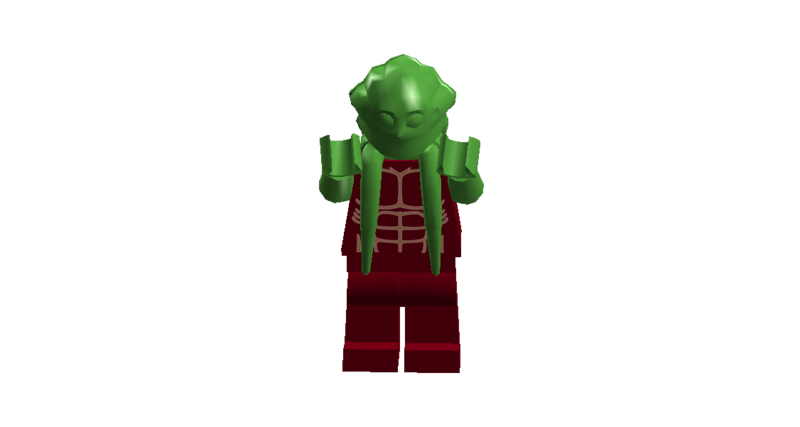 I’ve used the Lego SW Kit Fisto head as being appropriate to a cephalopoid race. Cephalon surface assault capabilities are exemplified by the powerful Octocrab mech. 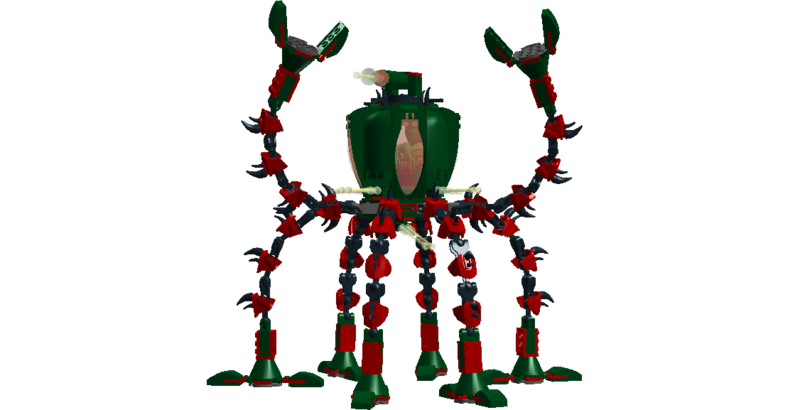 The Octocrab is an eight-legged walker with flexible legs ending in feet which double as powerful gripping claws, giving it a close-in combat ability unmatched even by the Federation’s own Tyrannomech (forthcoming build). Primary ranged armament is a high-powered antineutron beam in an underslung turret; this is backed up by a quartet of sponson-mounted twin neutron blasters and a further twin neutron blaster mounted in a rooftop turret. The Octocrab does not really have a “rear”. But this one is currently headed away. The Octocrab is typically crewed by four Cephalons. 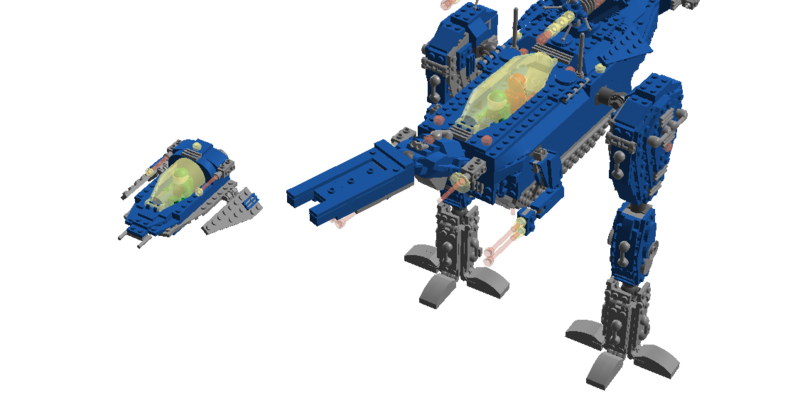 This entry was posted in Lego Classic Space, Mechs, Saurian Sector, Uncategorized and tagged Cephalopods, Classic Space, Galactic Federation, Lego, Lego Space, Mechs, Space Fleet Command on March 30, 2015 by geoffhorswood.